The DISCUS program is a unique tool to simulate disordered crystals and to calculate the single crystal and powder diffraction data as well as the PDF. A particular strength of the DISCUS program is its ability to simulate nanoparticles including their organic shell. Further tools are under development to improves particularly this last aspect. The program is open source current releases are found at: DISCUS Releases. The development page is located at DISCUS Source Code. Further information is also found at the DISCUS Wiki. DISCUS workshops in Erlangen are a regular event. The determination of the average structure of crystalline materials via the analysis of Bragg scattering data has long since become a routine method, at least for materials with moderate complexity. Structures with up to several hundred atoms per unit cell can be solved with user-friendly programs. But as soon as structures show disorder, the structure determination becomes much more complex. Modern, functional materials often show disorder; local ordering phenomena give rise to interesting physical properties and reveal important information about the interaction of atoms and molecules in crystalline materials. 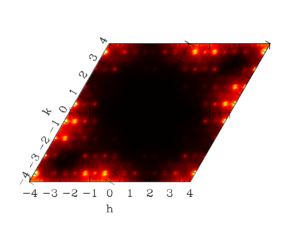 In our worḱgroup we investigate single crystal diffuse scattering as a method to analyze local ordering phenomena and defects in disordered crystalline materials. 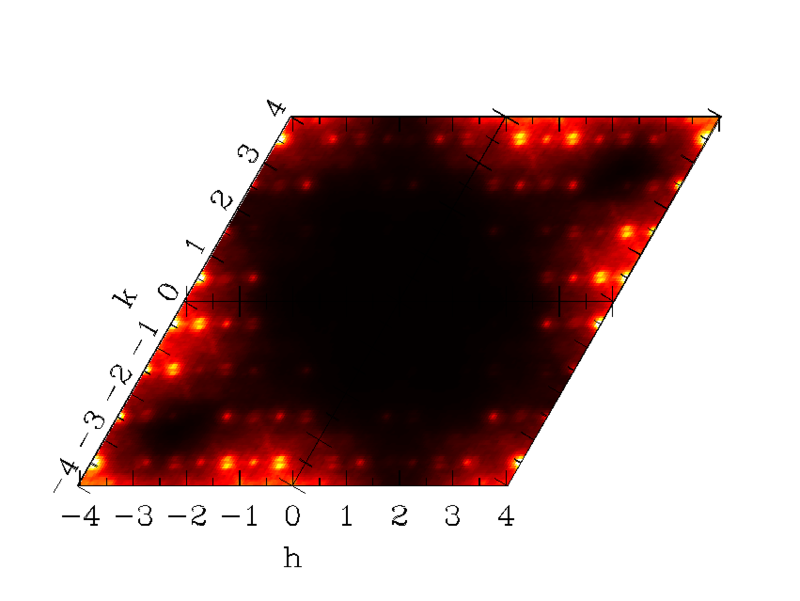 In a crystal, where the deviations from the average structure are distributed randomly, monotonic diffuse Laue scattering can be observed. Correlated defects, on the other hand, can be divided into two classes: Defects that modulate the probability of occupancy at different positions of the unit cell and defects that alter the structure by displacing the atoms/molecules statically. Different defects give rise to different diffuse scattering patterns that are broadly distributed in reciprocal space. 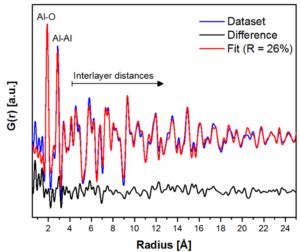 The analysis of these diffuse patterns enables qualitative statements about the type of defect present in the material, and quantitative statements about the correlation between the defects. Both experimental and theoretical aspects of diffuse single crystal scattering are investigated in our workgroup. We do single crystal diffuse scattering experiments at synchrotron sources with materials that showed, either several, different oriented molecular species in a single crystal structure refinement, or very high atomic/molecular displacement parameters. The obtained data is analyzed with the DISCUS program, enabling Monte Carlo modeling algorithms, to model diffuse scattering. Furthermore, we develop theoretical approaches for data analysis of diffuse scattering of molecular materials. The molecular form factor plays an important role in the shape of the diffuse scattering. Theoretical investigations are performed to decouple the influence of the molecular form factor from the diffuse scattering and obtain the pure disorder scattering. The aim of these approaches is to make the analysis of diffuse scattering a routine method for structure analysis. Simulated diffuse neutron scattering of an urea inclusion compound in the hk0 layer. We synthesize a series of nanoparticles such as ZnO, AlOOH and TiO2 and study their nucleation and growth with X-ray diffraction experiments at the ESRF in Grenoble, at DESY in Hamburg or at the APS in Chicago. With good time resolution we can follow the nucleation and growth of the nanoparticles at atomic resolution. Topics such as catalysis, energy conversion as well as the unquenchable thirst for green ways of energy generation and storage are nowadays widely spread in the scientific community. Herein, nanoscale materials (100nm +) rocketed in importance within recent years due to their tunable and enhanced physical and chemical properties which already have paved the way for various technical innovations. Our fundamental research mainly focuses on the sol-gel syntheses of nanoparticles possessing a maximum of 20 nm in size. In the course of the nanoparticle synthesis we attempt to monitor the nucleation, a cluster formation process as well as the subsequent atom rearrangements into a crystal lattice and the gradual growth of nanoparticles. In particular at later stages of the synthesis we are free to add various dopants or organic stabilizers to the synthesis in order to monitor effects on the resulting crystal structure or provide evidence for a potential surface functionalization. In real time synchrotron data is obtained during the synthesis and can be employed in order to deduce the PDF (Pair Distribution Function). By analyzing the PDFs we are able to extract information on the particle morphology and atom positions at various points in time. Based on the experimental data, ideally, we propose mechanisms for the growth of several nanoparticle types which has been as yet an approach purely theoretical in its nature. Additionally, our group investigates the influences of variables such as pH, temperature, solvent properties or degree of aggregation on the nanoparticle growth. 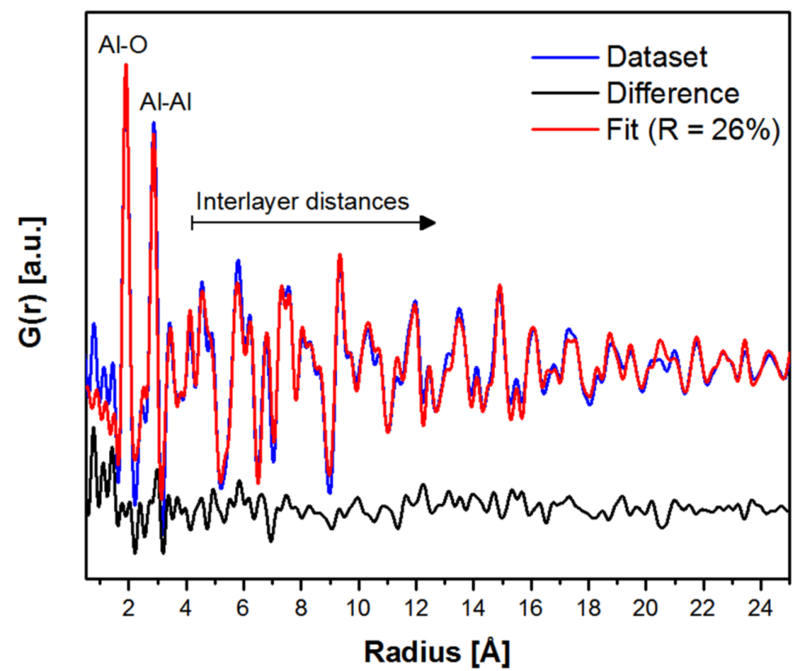 Moreover, we are comparing and developing adequate methods of data reduction in order to facilitate the data analysis of amorphous or defect rich structures with next generation Dectris detectors at synchrotron facilities.